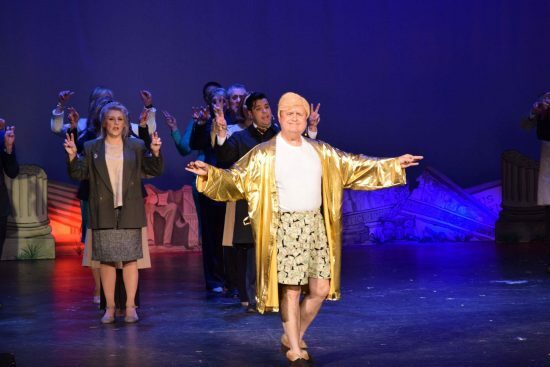 Steve Dasbach as Trump in his golden robe in Hexagon’s ‘Tweet Land of Liberty.’ Photo provided by Hexagon. Hex, as the group is proud to say, is the only local group that does it this way. It gears up for a single annual show, the product of untold dedicated volunteers that work tirelessly to produce an original comedy satire for its targeted charity. They keep it cheeky and topical, and in the past two years, what a goldmine of topics to dive into. The Trump count was actually lower than expected, down considerably from last year’s surprise election, though we are initially treated to a White House press conference where spokespeep Sarah Sanders deftly deflects pointed questions as only she can. A nod to Cristen Stepansky and her pearls. A notable number that highlights the inspired silliness that can burst out of Hex is the song “Where Did the Air Come From?” exposing the supposed conspiracy (aren’t we chock full of them?) of some countries manufacturing packing bubbles with contaminated air. Who wants air from Beijing and Karachi? Other clever songs and sketches focus on our technology addiction, such as letting Siri take over our lives and relationships, and our 21st-century reliance on YouTube. They keep it cheeky and topical, and in the past two years, what a goldmine of topics to dive into. Some of the musical numbers hit upon social upheaval and recent tragic events, including “I Am America,” a lighthearted “Why We Kneel,” and “Thoughts and Prayers” a questionable reaction to the sensitive Lakeland and other shootings. It was reflective but by its very nature forced the festivities into repeated sobering moments. Deidre Gyr Turshen, the music director, has crafted original music with many different styles, no small task. The acoustics can be challenging at this venue and sharpness will increase as some issues are ironed out technically. Director Jennifer Strand is handling many moving parts onstage, creating diverse pictures on many subjects. Choreographer Teri Allred and Kay Casstevens are given nods for their work with the vaunted Hexagon kick line and tap routines. President Joe Kaplan, who also hoofs it onstage, says “frankly, some of the real news is sometimes too difficult to think about.” Whether referring to eyebrow-raising tweets, White House palace intrigue, the #metoo movement or distrust of the FBI apparatus, we are in a fascinating time. His notable performance in “Sign the Form” with Kathy Suydam is a paperwork explosion back and forth between two lawyers accompanying a couple on a date and frantically manage each interaction. Be prepared for a Hexagon chestnut, the well-known returning Newsbreak segment that pops up throughout the show. Local news celebs give this a DC feel as they sit in to do news setups akin to the SNL weekend update, to a mixture of guffaws and groan-inducing responses. On the night of my viewing, our Newsbreak celebs were mainstay Congresswoman Eleanor Holmes Norton and, lending his pipes from WTOP was Chas Henry. Hexagon proudly says that their efforts to-date has garnered 4 million for the causes that they support. This year’s recipient of Hexagon’s hard work is the DC Grassroots Project, which connects college students with middle school students in a mentoring program to guide them on health-related issues. Hexagon is an inside baseball type of show. And an inside the beltway type of show. Drop by for some laughs and groans and have laugh night out for ol’ DC and charity. “Tweet Land of Liberty” is presented by Hexagon, 3950 Chesapeake St NW, Washington DC from March 2 – 24, 2018. For tickets to this year’s show, call the information line at 202-333-SHOW (7469), or online.